"Hope You Have A Ball This Christmas!" Imagine these baseball Christmas cards being handed round amongst friends this Christmas season. Fans of this wonderful game will love receiving these Christmas greeting cards. And these lovely cards will not just be enjoyed for the season but will be kept and taken out to enjoy with children and grandchildren. So if you have someone in your family or a friend who loves watching baseball matches or plays baseball, then you could so easily make this baseball holiday card for him. This is a very simple card to make. The method is the same as making Soccer Christmas Cards. All you need is a baseball image which you can easily find on the internet. Just type in the word 'baseball image' on the Google search bar and click Search and you will get a pages and pages of them. Some sites allow you to save these images to your hard-disk to print out for personal use. Here's the baseball Christmas card I created from a clipart image. You can edit or enlarge the image in Photoshop CS, Photoshop Elements or other editing softwares. Make it to measure 6 inches in diameter. Use white cardstock to print out this image. (You will need a 6.25"x6.25" square envelope for this holiday card design. 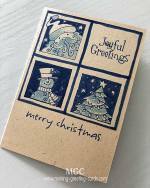 Now if you have not add the Christmas message "Merry Christmas" on your image before printing, you can do so using a clear rubber stamp. A clear rubber stamp enables you to view the card and make accurate placement. 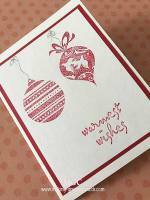 For this card I use a Christmas word stamp by Hero Arts. And I stamped the words in black. 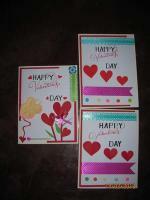 Then I lay the image over another white cardstock and trim around both the cards. Make a vertical scoreline on the left side of the image about half an inch from the edge to make a flap. Apply glue to the flap and attach to the other cut out piece of white cardstock. And the baseball holiday card is ready. 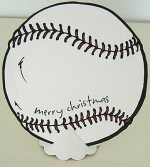 Use this design or modify it to make more baseball Christmas cards to send to baseball fans. I'm sure they will appreciate it. Remember to handwrite a Christmas quote or Christmas card verse. A handwritten note is so much more personal than a computer printed one. These are really great impressive handmade cards to send your Christmas greetings to sporty friends and family members. Use clear embossing powder on coloured stamped images. If you missed any stray powder, it's not noticeable.